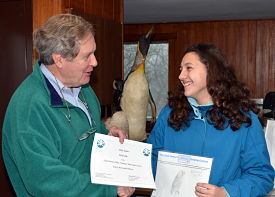 Abby Jupin has been selected as the winner of the Lloyd Center for the Environment’s first ‘Draw an Organism’ contest. After observing the Center’s Red-shouldered Hawk in action, Abby’s decision was made, she would draw a hawk standing on a perch. The Lloyd Center’s intent of holding the contest was two-fold, to offer an inexpensive destination for families to visit over vacation, and an activity to get children involved with the natural world around them. Families visited the Lloyd Center, walked the trails, explored the estuary and nature center, and the children drew an organism that they found during their travels. D’Arcy MacMahon, Lloyd Center Executive Director, presented Abby with a certificate of accomplishment, a Lloyd Center family membership and t-shirt. Abigail’s drawing will be put on display at the Lloyd Center. Photo: Lloyd Center Executive Director, D’Arcy MacMahon presented an award to Abby Jupin in the Lloyd Center for the Environment’s first ‘Draw an Organism’ contest. Abby’s entry of a hawk, inspired by the Center’s Red-shouldered Hawk was one of 15 that were submitted in the contest.